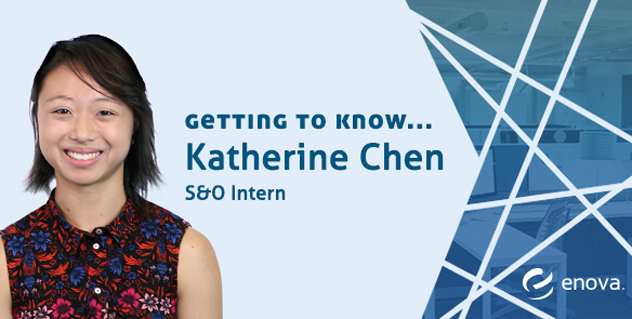 Getting to Know Enova Interns, Featuring Katherine Chen - Enova International, Inc.
As a Strategy & Operations (S&O) intern at Enova, I had the pleasure of doing the work of a full-time employee and learning the skills that a full-time employee would have. Throughout my internship, I experienced the perks, got to know some awesome people and learned skills in a variety of areas. Here was typical day for me: I’d get to work around 9:00 am, check my emails and calendar, see if there was anything that I needed to do that day and made note of meetings I had. I’d then get some breakfast in the kitchen — it has pretty much everything you need for a really solid breakfast. To be honest, not having to make breakfast at home or buy breakfast food was one of the best perks at Enova. I’d go back to my desk ready to take on whatever tasks I had for that day. During my time at I Enova I worked on several projects spanning the wide range that S&O covers. My work covered a wide variety of tasks. Some days I’d be writing and testing queries and assessing a project’s impact or the quality of a department. Other times I’d be listening to call center calls for process improvement or meeting with product managers to revamp customer online experiences. Later, I’d review my week’s priorities with my manager and our S&O team manager. These meetings were invaluable for me: I was learning how to prioritize my work, how to communicate what I was doing and planning to do and determining the next steps. I’d always leave each meeting with a new set of to-do’s and the determination to succeed. My manager and all members on my team were fantastic at providing support and guidance, while allowing me to take ownership of my projects too. I met with a wide variety of people at Enova to learn more about the topics relevant to my projects. This included project managers, analytics, operations, legal and more. And these are people who I met through project-related meetings. It definitely doesn’t include those who I met informally through Enova networking events like happy hours, intern events or just in the kitchen. It’s crazy to think that I’m finished with this internship, and the summer has come to a close. I’ve learned so much about working at a tech company in the finance industry, a place that I never thought I’d find myself in. I’m excited for what’s next!